← Top Billing… on our Walls? 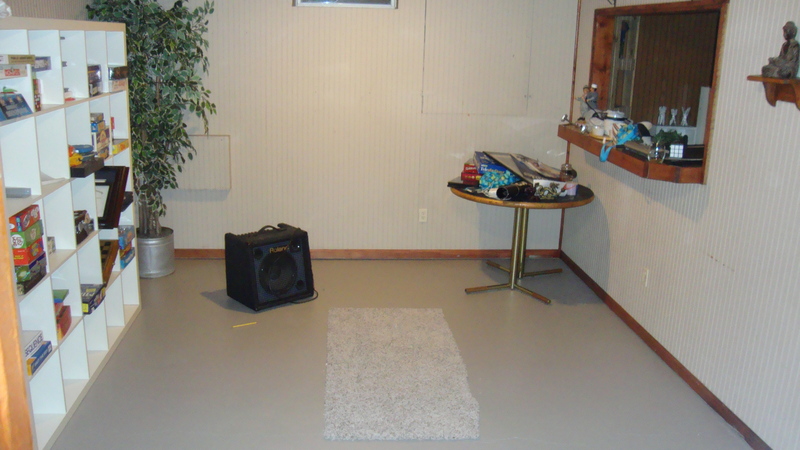 Painting your basement concrete is a super fast and inexpensive way to make a dingy basement feel like a livable part of your home! Our house has a partially finished basement. 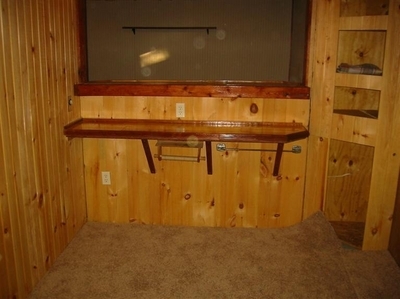 The previous owners added electrical wiring, paneling and room dividers. It is a great start. Down the line, we would like to finish the basement but in the meantime we wanted to take advantage of all that extra room. At the bottom of the stairs we have what we are making a board game room. Our friends made us a game table and painted the top with chalkboard paint! I can’t wait to have lots of game nights! There is a bar leading off of the game room into what we are calling the “little kitchen.” We plan on stocking this full of game night and movie snacks and treats. 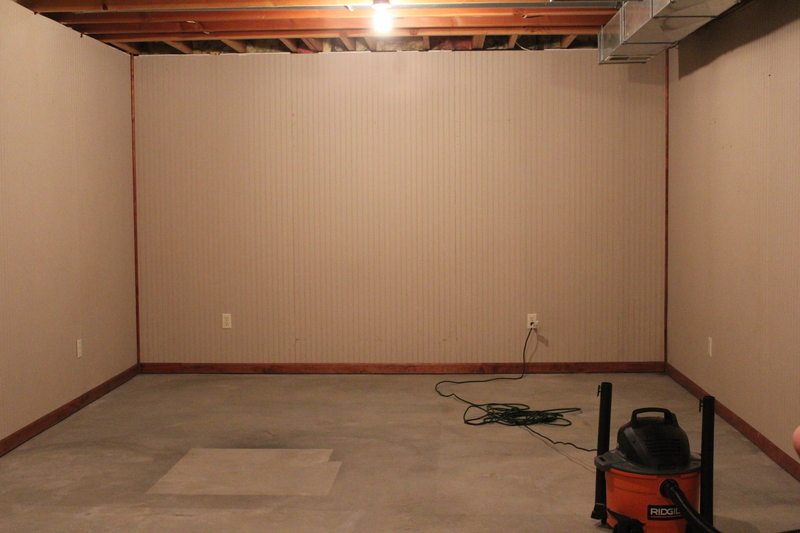 In the largest room we hope to make a family room with a large TV or maybe even a projector down the line. During our walk though, there were huge mirrors lining the wall in this room and so we have always called this the “Dance Studio.” Unfortunately, I don’t have any pictures because we took the mirrors down right away. You can see them in the picture above leaning against the wall on the right. Kurt’s mom let us know that she was going to give us a large sectional and some other large furniture. 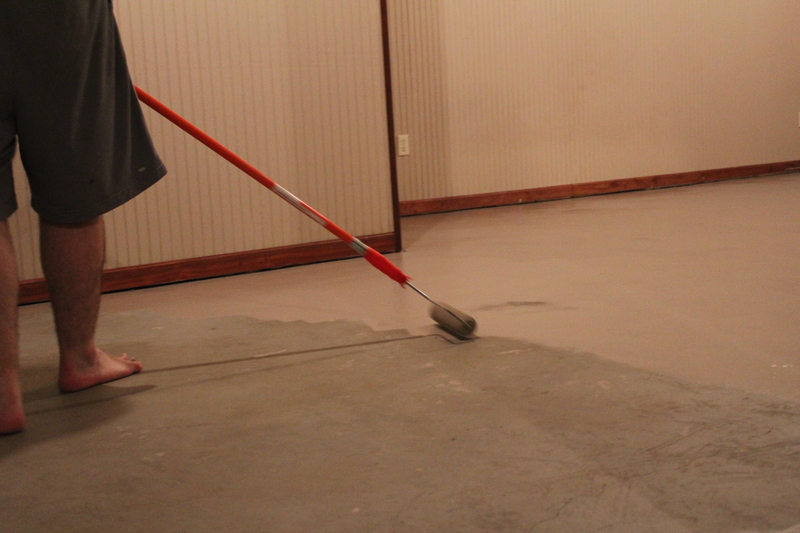 We knew it was time to do something to the floor in the basement. 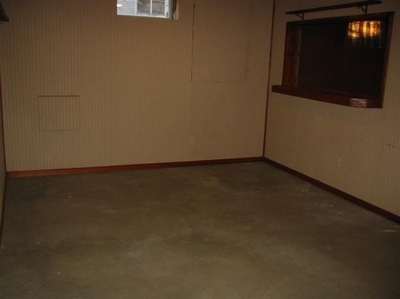 The concrete was like any typical basement: lots of discoloration and VERY dirty. We would like to add carpet, hardwood, or even laminate down the line but it didn’t really fit into our budget for now. It also makes us nervous to spend a lot of money on flooring for the basement until we live here for a while to make sure that flooding won’t be an issue. Our phase one solution was to paint the floor and use area rugs to help define the spaces. The first step was to clean, clean, and then clean some more. 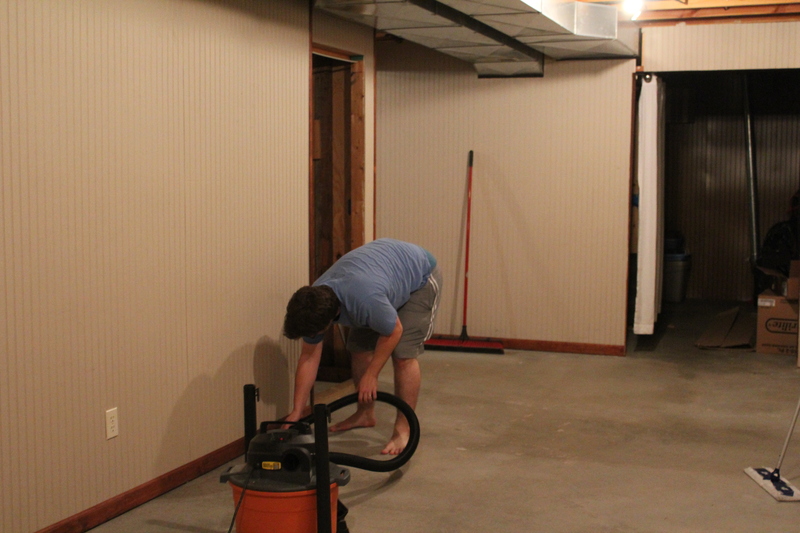 We used a shop vac, push broom and a swiffer to try and get up all the dust and cobwebbies from years of creepy basement life. Then it was time to start painting. We used Behr Premium 1 part epoxy paint that we picked up from the Home Depot in the color “Pebbled Path.” It is a really pretty gray and it is actually very similar to “Fawn Brindle” by Sherwin Williams which you may recognize form the walls on the main level. What can I say, I know what I like! I cut in around the baseboards using a two inch angled brush. Kurt filled in with a roller on an extended handle. Normally, the goal is to keep paint from touching the floor with drop clothes and painters tape and it was so much fun to pour gallons of paint right on the floor! We used about three gallons of paint to cover all three rooms over the course of a couple of weeks. We split up the painting by room so that we could just shuffle the furniture around without hauling everything back upstairs. I am really happy with the results. The color matches on the gallons of paint were spot on and you can’t see seems from paint applied more than a week apart! Gotta love it! This paint had great coverage and we were able to get away with just two coats. We let the first coat dry overnight and did the second coat the next day. We waited about two days for the paint to cure before adding any furniture back in and we haven’t had any issues with scrapes or chips. It is hard to see the difference in pictures since we went with a gray paint. However, in person it looks so fresh and clean. We have plans to paint the floor in the garage and possibly even the front porch. It is a wonderful neutral greige color that can be layered with just about anything. We are playing around with the idea of bold bright walls and neutral furniture peices, white/light walls with a splash of accent colors in rugs and furniture, or perhaps something else entirely. What do you think would look best? Is there another option we haven’t considered? I have a laundry room and garage and front porch stairs that are all concrete and could use a major facelift. I think I’ll have to test this paint! ~M. Makes sense not to waste money on laminates until you’re sure that water is not going to seap in during the rains. Yes, definitely! It would be a shame to lose all that hard work and money! Down the line we may end up finishing the basement after we see how it holds up. But so far this summer we are loving the painted concrete! Especially since we don’t have AC. So who knows, we may just keep it for the long haul! Thanks for stopping by!! 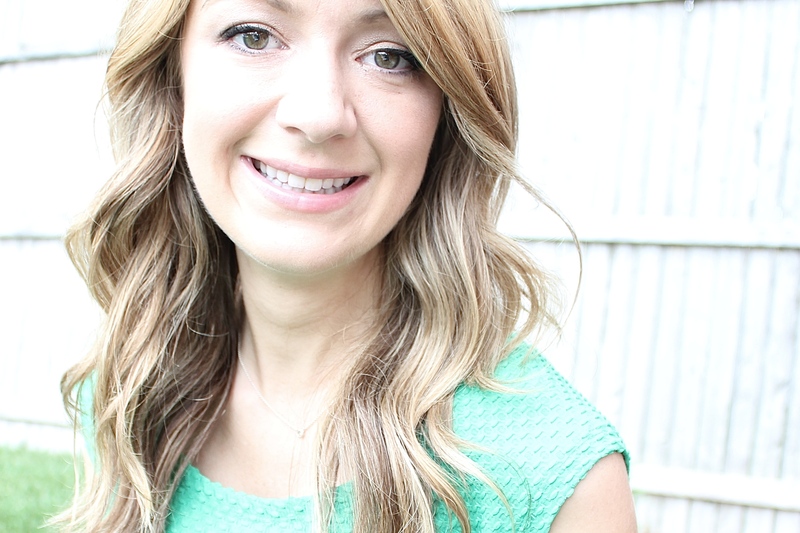 Katie, did you use the TSH to clean your basement floor prior to painting it? and did you use the concrete primer prior to painting with the Behr concrete & garage floor paint? 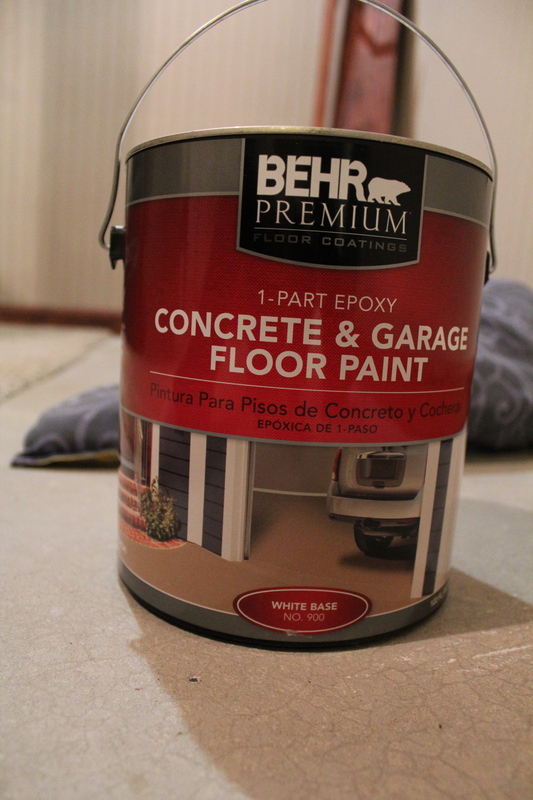 I am getting ready to do my basement floor and have already purchased the above paint in a light grey color and I also purchased the matching Behr concrete primer to put down before painting. Was wondering if the primer is an added step I really do not need, the primer is a light grey in color so I am hoping a single coat of the more expensive Behr concrete & garage floor paint over the primer will do. Debbie, I just ran the swiffer sweeper and mop over the floor many times. 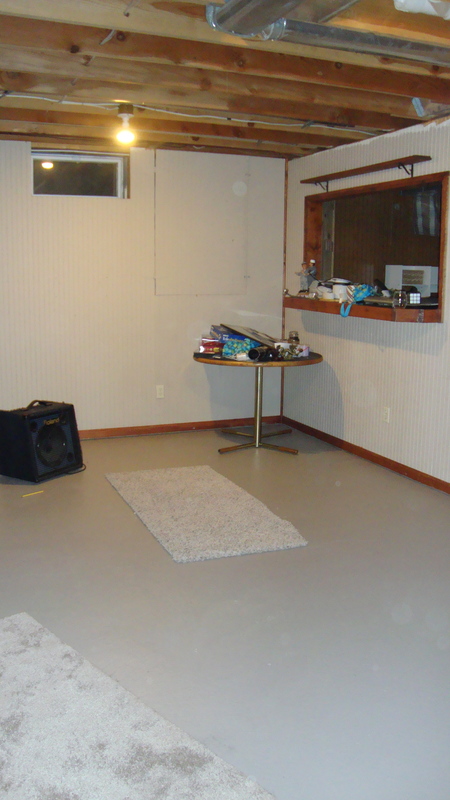 Being a basement floor, it still wasn’t perfect in terms of cleanliness, but I was ok with that and the final results looked great. I believe we did two coats of paint and I did not prime the floor beforehand. With a coat of gray primer you will probably be fine with a single coat. In my experience, the Behr paint is SO worth the price tag. It has great coverage and durability. I hope this helps. Good luck with your project! !